This year marks the fiftieth anniversary of the first time that man walked on the moon. When Neil Armstrong said, “That’s one small step for man, one giant leap for mankind,” he could have been referring to many things. One interpretation is that his small step was made possible by the many small steps that contributed to his success. The Apollo missions are an excellent example of how small things can add up to great advances. The missions were built on great advances in science, but each advance was itself a series of smaller steps. We have seen that pattern throughout history, and it continues to unfold. That pattern could be unfolding in self driving cars which will require thousands of small advances to take a giant leap. Texas Instruments Incorporated (Nasdaq: TXN) designs, manufactures, and sells semiconductors to electronics designers and manufacturers worldwide. The company recently took the wraps off a buck converter, which it claims to be the industry’s 100-V input, wide-input-voltage (VIN) synchronous DC/DC buck converter. It could take just a small new advance to push TXN out of the trading range that has been in place for more than a year. The short-term chart shows that TXN also broke out of a small trading range and could now be set up for a quick move higher. 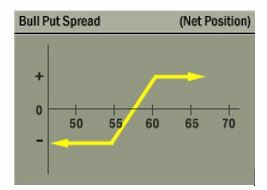 For TXN, a bull put spread could be opened with the April 18 put options. This trade can be opened by selling the April 18 $105 put option for about $0.95 and buying the April 18 $115 put for about $5.80. This trade would result in a credit of $4.85, or $485 per contract since each contract covers 100 shares. That amount is also the maximum potential gain of the trade. The maximum possible risk is the difference between the exercise prices of the two options less the premium received. For this trade, the difference between exercise prices is $10 ($115 – $105). This is multiplied by 100 since each contract covers 100 shares. Subtracting the premium from that difference means, in dollar terms, the total risk on the trade is then $515 ($1,000 – $485). The potential gain is about 94% of the amount of capital risked. This trade will be open for a relatively short amount of time and the annualized rate of return provides a significant gain.